Modern day society continues to push the mentality of doing things “big” and bold. “Go big or go home” is no longer just a term used on the sports field, but also rather in the office, at the factory, or even in the classroom. We are wired to take things to the max and “push it to the limit.” But what about fishing? Or better yet, what about those first few weeks after ice-out when the panfish are still in “ice mode” trying to find their appetite? “Go big or go home” might send you off with the latter, but “go small or go home” could be the ticket to an amazing day on the water. So what does “ Go Small or Go Home ” mean exactly? For me, it means keeping you ice fishing tackle with you when you first hit the open water scene. When you sit back and think about it, you just finished up your ice fishing season (maybe literally only days ago?) and the last thing you threw at those fish where size 10 ice jigs tipped with finesse plastics. You weren’t using a big twister tail or minnow bait, you were slicing and dicing big panfish with smaller offerings. That trend will continue as you hit the first few weeks of open water, especially when the water temps hover in the 40s. Keep those ice jigs and plastics with you. Now, I’m not saying you need to break out the 1/200oz, size 16 hook ice jigs, but those size 10 and 8 jigs are more applicable for the situation. I prefer tungsten myself; since it allows you to keep better contact with the jig (if vertically jigging) and better pull under the float (if you decide to pitch a float setup). Then I usually tipped these jigs with a finesse plastic of some sort. Clam Pro Tackle offers a nice arrange of jigs and plastics to get the job done. The Drop series jigs are dynamite for early season panfish, and when you tip those with a Maki plastic of your choice you have yourself a deadly one-two punch for coldwater spring panfish. Why do fish prefer these smaller presentations you might ask? Well, for one, they are still eating a “lighter” diet. Water temps are cold and their metabolisms are slowly warming up from the deep freeze. 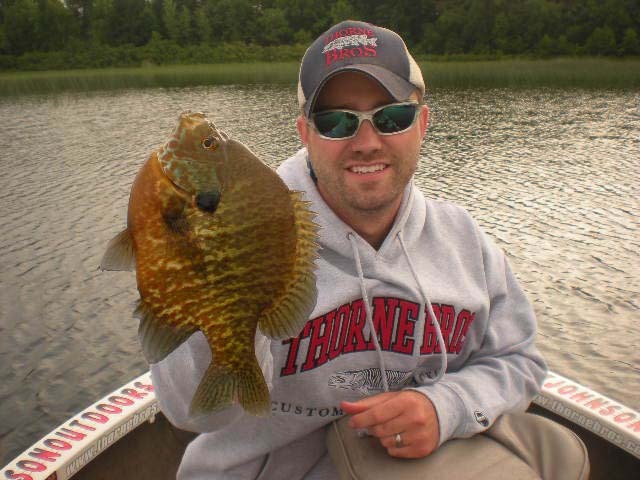 During much of the winter, panfish are consuming smaller morsels and prey, and their bodies still feel as if the surrounding conditions are “cold.” As the water temps begin to rise—along with spring oxygen and libido—these fish will begin putting on the feedbags and devouring anything in their path, but we’re not quite there yet. Continue to feed them their “comfort food” and you’ll find more fish on the end of your line. This idea of fishing small is not complex, and every angler is capable of mastering this technique, you just need to keep the ice tackle out a little longer. Bring along your jig box packed with tungsten jigs and your Ziploc bags of finesse plastics when you first hit the open water scene this year, you won’t regret it!